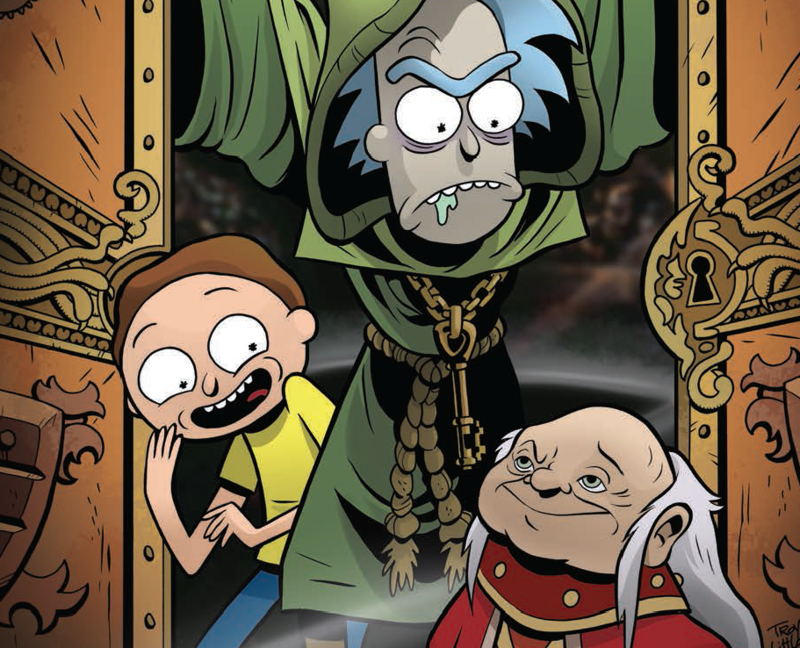 Rick and Morty vs. Dungeons & Dragons #3 Review – AiPT! Rick and Morty go full fantasy in this great penultimate issue. One might think having Rick and Morty cross over with a roleplaying game doesn’t quite make sense, but this is Dungeons & Dragons we’re talking about. The series has been fantastic with Patrick Rothfuss and Jim Zub at the helm, and the added benefit of excellent artist Troy Little. I’ve loved every issue as it explores D&D while mixing in dirty humor and sci-fi sensibilities. In this third and penultimate issue, things get really bad for the Sanchez family and it’s all thanks to Jerry being…very flipping good at D&D! With the show on hiatus I think I speak for any true Rick and Morty fan when I say you’ll take R&M however you can get it. Add in the fact that this series is co-written by the excellent fantasy writer Patrick Rothfuss and it’s a no lose situation. Read my review of issue #2 here. This series has been very good at changing things up with each issue. It never moves too slowly or attempts to drag things out. So far Rick and Morty have played Dungeons & Dragons in two different ways and in this issue they play in a third way. It’s frankly the most logical given their dimension-hopping abilities as they find a universe where Dungeons & Dragons is basically real life. That includes a narrative overseer who can give each of these everyday people all the powers on their character sheet and remove all the tricks Rick has been using to be in control of every situation. Speaking of Rick’s obsession with control, this issue delves a bit into the weaknesses and hidden positive traits of the characters. Rick is essentially cut off at the knees as his ability to fix a situation is removed so that the game may be played out as it should. Meanwhile, Jerry is in his element and the way he is written, one might argue he’d be a great man if given a bit of help in the traits department. Zub and Rothfuss develop all the characters well while also weaving in interesting fantasy elements, D&D insider jokes, and plenty of humorous violence. There’s no telling if this story is in canon, but if it was the direction the story is taking the characters is meaningful. The art by Little is a real treat. There’s a lot going on in this issue with battles requiring readers to know where each character is and showing off their killer moves. This isn’t your typical two-shot Rick and Morty episode, but a story that requires visual pizazz and creativity because it has taken the characters very far from their usual visual roots. They all look a bit different, eh? The first two issues managed to mix sci-fi with fantasy but in this issue, it’s much more fantasy. That’s unfortunate since that blending was a great element of the last issue. One could argue this is leaning more like a Dungeons & Dragons focused crossover issue than the Rick and Morty side of things so that makes sense. At least the characters are true to their usual depictions albeit with a fantasy slant. Fantasy lovers rejoice: this is the Rick and Morty experience you were waiting for. The series has done a great job blending the two, but it leans heavily on fantasy tropes in this issue. Fantasy lovers rejoice, this is the Rick and Morty experience you were waiting for. The series has done a great job blending the two, but it leans heavily on fantasy tropes in this issue.